Musings about the process of creating dance. We are surrounded by numbers. In many ways, numbers control much of our lives. We are kept in check by the numbers on a clock. We are made aware of our presence on this earth by counting our birthdays. We know how long it will take to go to the moon because we know how far away it is and how fast we can travel because of the computations of scientists. We create phrases to music or rhythm with dancers based on counts or breath because we are tied to the original rhythm of the heartbeat. All numbers. 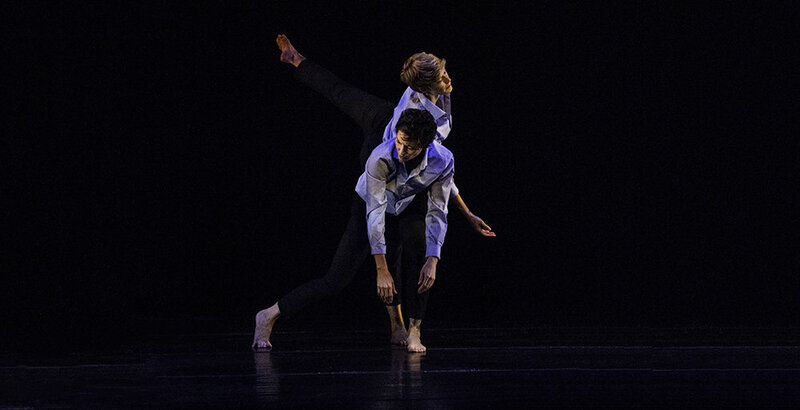 This year, NEDT marks its 10th year as a performing company. A decade. Definitely, a milestone…and a time to reflect on what has been accomplished. Over ten years, we have consistently performed new work, have branched out from solely featuring my choreography to embracing the work of company members and outside artists, toured locally and regionally, performed in a multitude of festivals, reconstructed historically valuable choreography, have had a company of mixed genders and of women only, have earned a reputation for storytelling as truly a dance-theatre company, been commissioned by the Norton Simon Museum, and four of our current company members have been involved from the beginning. In ten years’ time, we have created 48 new works. We rehearse only twice a week. We have operated on a shoestring budget, but managed to double our performance pay to our dancers, as well as moving from our humble beginnings under the umbrella of Outpost Theatre Ensemble’s nonprofit to now having our own 501(c)3. We are a dedicated bunch. We love to create. We love to perform. By definition, collaboration is the process of working together. People do it all the time–or do they? Collaboration, at its best, is not an easy process. It requires a high level of communication skills. Mostly, it demands that the intended result be at its highest level. And that’s where things can get sticky. Looking back on the recent collaborative event with Rebecca R. Levy, Artistic Director of Jacksonville Dance Theatre (JDT), I can tell you that I learned a great deal from making this mutual commitment. Becca and I have been talking about working together for several years. People always talk about “meeting for coffee” or “getting together”—it’s a part of our 21st Century culture, I think. But we are all so busy that it rarely occurs. I am grateful that both Becca and Jenn Logan spearheaded this project, and I am extremely happy that Becca and I came together from opposite sides of the US to bring this concert series to its fruition. Setting the logistics of the timetable was complicated for our Executive Directors, juggling the schedules of 15 people, in all. That was something finite, however. The real challenge was deciding what the collaboration would be. In email and phone discussions with Becca, we determined that it was not enough to simply share a concert—JDT doing its repertory, and NEDT doing its repertory. Anyone can do that, and there’s no RISK. To collaborate is to take a monumental risk. It is not a process of give-and-take. That is compromise. It is a process of give-and-give, of defining and listening. Most importantly—listening. What did each of us envision? What part of that vision was shared? We decided to include each other’s dancers in existing repertory of our individual companies. In some cases, that meant expanding the numbers in sections of work, in others, it meant mixing up dancers in sections, and thereby working together across companies. That was exciting, especially since we knew we would be fusing everything together when NEDT arrived in Jacksonville on September 7th for a September 8th performance. But that wasn’t enough. To truly collaborate meant that Becca and I needed to share something new between us. New and untried. RISK. So—we gave ourselves parameters in order to create a fluid structure for a solo. Each of us crafted three phrases of 20 seconds or so. They did not need to connect to each other, except in that they were to express “inside/outside.” We sent our phrases to each other. The next prompt was to create 4 minutes of dance using all six phrases - in any order or partial order that we wanted to, on one of our dancers: NEDT’s Jenn Logan, and JDT’s Tiffany Santiero. We did not share how that would look. The two solos would be performed simultaneously, and we had no idea how of if they would reflect or meet each other on the stage. I suggested a piece of Shumann music - a piano sonata. Becca and Tiffany had trouble with the music, feeling that it restricted them too much. Becca suggested a local Jacksonville composer that she’d worked with before who is a pianist, to create something for the piece. I don’t know him, and have never heard his work, but I trusted Becca’s judgment, and said “ok.” RISK. We continued working, in silence. Unfortunately, the pianist had an emergency situation come up and he was unable to make a score. We decided to revisit the Shumann. Becca listened to my thoughts that the music had plenty of space within its structure to accommodate our movement. She said “ok.” RISK. Jenn went to Jacksonville early, and she and Tiffany worked with Becca one afternoon to then fuse the two solos into a duet. I was not present. RISK. I saw the piece for the first time in tech. I made two observations that were incorporated into the final rendition, and we had a dance. Not a title, but a dance. It went on the program as “Untitled.” I’m a big one for titles, but neither of us had a clue what to call it, and were under other pressures to get everything together, so “Untitled” it was. The concert went off without a hitch. The dancers blended beautifully, and the result was magical. The evening was a great success—for us as companies, and especially for the audience, who also took a risk in coming out on a Saturday night to participate with us. I don’t recommend collaboration to anyone unless they are willing to TRUST, take a RISK, and keep the highest quality of the work at the forefront, not one’s ego. Becca and I had a wonderful experience, and I would do it again with her in a heartbeat. Perhaps there is a title for the duet…RISK. Click here for tickets to see the collaboration this October. My mentor, Hanya Holm, often spoke about the need to explore every movement to its extremes so that you have more to choose from when you work. When I had the privilege to study and dance with Nancy Hauser and her company, she infused improvisation into our daily routine. Nancy taught me not only how to improvise, but how to use it as a way to extend my vision. For me, “improv-ing” is much different than putting on a piece of music and moving to it -- although there is nothing wrong with that. In fact, there is no “right” or “wrong” when improvising. It is a tool for exploration; an immersion in the present tense; an opportunity to expand your own inner and outer awareness of the space within you and outside of you. Just as a writer uses specific language to describe or narrate, an artist who improvises discovers specific language for her/himself. At NEDT, we are using structured improv regularly in our class and rehearsal process to help us stretch our boundaries and become better interrelated when we dance. Sometimes we use parts of speech such as adjectives or verbs as a springboard for exploration. Sometimes we use more pedestrian actions like walking, sitting, nervous habits -- again, as a springboard to find new ways to move. We always begin our improv session working solo altogether in the space. Sometimes it stays that way, and sometimes we incorporate other dancers in the progression. Starting out solo helps the individual to center and focus inward, helping to remove distractions or a feeling of being scattered. Once the prompt of the improv has been individually established in movement, then it is often a normal progression to involve others and collaborate, further expanding and defining the original prompt. Sometimes, when I lead the improv, I will make adjustments to the prompt while the dancers are improvising, giving instruction or guidance into moving the process forward. Sometimes, I say nothing, allowing the dancers to explore, evolve, collaborate, devolve and organically finish the improv when it has exhausted itself. Every dance has a core. Every dance is “about” something. Maybe there is no storyline, but movement is language. The core of the dance should inform the movement, which may mean that the choreographer will need to stretch beyond a “style” in order to achieve what the dance demands. Using improvisation in the studio, or asking dancers to improvise in order to draw from their movement to help fulfill the choreography is a great way to bring your idea into reality. The beauty of improvisation as a tool to the choreographer, is that when “stuck” in a choreographic loop, it can free both the choreographer and the dancer by allowing them to stop and return to an organic approach to the concept of the piece. Improvising can bring new movement that the choreographer may never have conceived alone that will take the dance to the next level. Why should a dancer improvise? TO IMPROVE! After dancing with NEDT for several years, I decided it was time for me to choreograph for a change. Several heavy pieces already existed in our repertoire, so I wanted to do something light, and hopefully fun, for the cast as well as the audience. Fairy tales and nursery rhymes have always been dear to me, and I decided to lean on a well known story to fill in any gaps I might leave as a choreographer. The Little Red Riding Hood story started off the series as there is a lot of room for both humor and athleticism in that tale. The second installment based on the Three Little Pigs was the next logical extension, even if my treatment of it was not. Several little jokes worked their way into the pieces: some obvious, some subtle but perceptible to an attentive audience, some just for me. The creation process for both sections of Be Afraid of Virginia Woolf, “The Girl in Red” and “In a Pig’s Eye”, was very different than how I’ve worked before, or how any of my mentors worked. Since the pieces are story driven, I started with a live-action story boarding process. I used character placement on stage to shape how I wanted the interactions to feel, then added more specific movements and levels as we progressed. From the outside, it felt a bit like watching a Polaroid develop. From the inside, I may have frustrated my dancers a bit by not giving them specific steps from the get-go. All of the dancers, however, rose to the challenge and brought their characters to life. By working with such well known stories, the visuals were more important to me initially than specific movements. Consequently, the costumes were developed in tandem with, or even before, the movement. 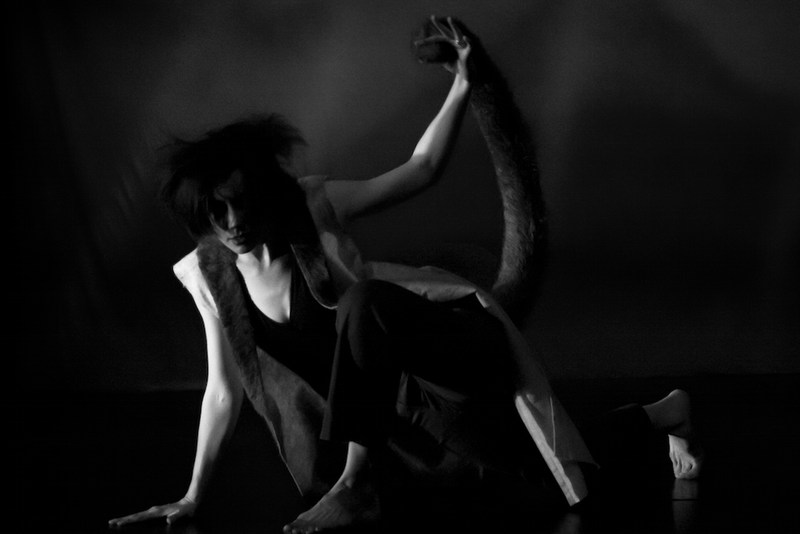 The most innovative costume/dance collaboration was Jenn Logan’s use of the wolf tail. I wanted an oversized tail that she could add femininity to, much like the cat from the Pepe le Pew cartoons. After some brain storming with Jenn and a few trips to hardware stores and fabric stores, the long, springy, furry tail came into being. An evening of Jenn improving with the apparatus brought about a majority of the movements that were ultimately used in both pieces. For “The Girl in Red” the cloak was a must. Again, the costume dictated much of the movement. In many cases I was choreographing the cape and directing the dancer, Katrina Amerine, a bit like a puppeteer. As the story-boarding progressed, Katrina added more and more of her own character elements bringing to life a Red who was real, brave, and naïve bordering on ditzy; just as Red should be. The three little pigs started with an even more exact visual seed. I wanted pigs en pointe, with the multiple tutus, and knew I wanted to use Gilbert and Sullivan’s “Three Little Maids from School” from “The Mikado.” I have to again thank Jenn for collaborating on the story-boarding process. The challenge from there was to find the additional music that fit both the narrative and the seed idea. After talking myself into and out of it several times, I settled on excerpts of the ballet music from “Faust.” Not only did I like the music, but also liked the connotation of the decent into hell as the wolf stalked and ate the pigs. Oh yes, in my mother’s version the wolf always ate the first two pigs! There is more to come in the saga of Virginia Woolf. The exact details are still to be decided: whether she will have a suitor, or if we’ll further explore her taste for mutton and wild game. In 2014 I was invited to create an original work for WeAreTheContributors.com, an online space that brings together artists, designers, photographers and all kinds of makers around creative projects to inspire and build community across mediums. We were asked to explore the theme, Alter Ego—to inhabit the mind, space and life of another person or another facet of ourselves. By some odd cosmic coincidence I had just begun to explore a new dance work that explored exactly that, though I didn't know it yet. What started out as a solo, set on Jen Hunter, about fear became a duet about control....because as it turns out, my biggest fear is losing control. What we uncovered as the piece developed were two very distinct personas that I use to keep my fear in check. There is the external persona (calm, collected, balanced) that I show the world, and the internal persona (pushing, driving, controlling) that gets me through the day — my alter ego. This piece, performed by Jen Hunter and myself, is an illustration of the struggle that's usually, expertly hidden from view. Watch the original Alter Ego here.